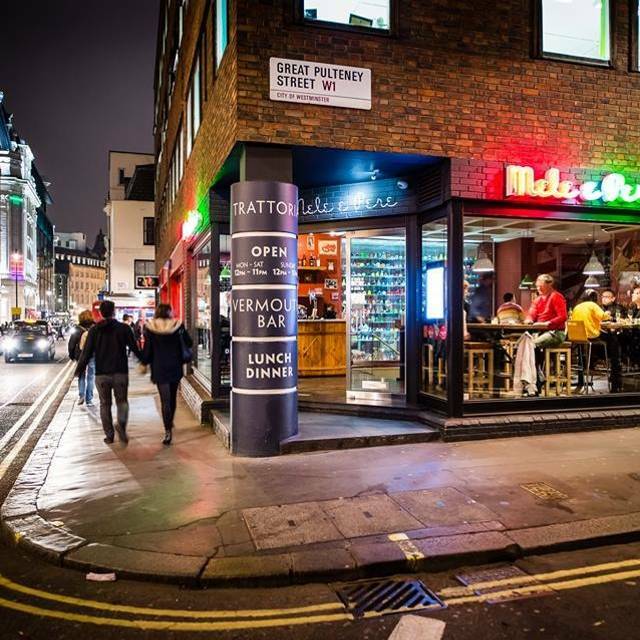 An Italian restaurant with a difference, Mele e Pere is brought to London’s Soho by Peter Hughes and Andrea Mantovani, previously of the acclaimed Wild Honey. 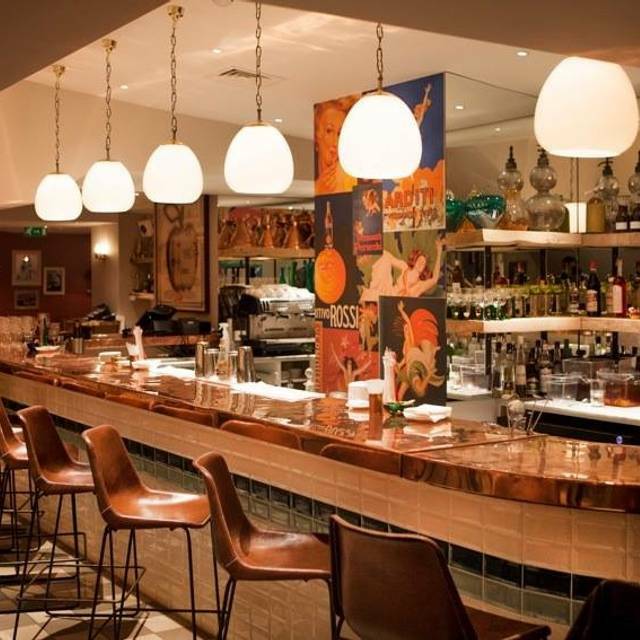 From the moment you arrive in Mele e Pere you know you’re in for… something a little different – the basement interior is utterly unlike any Italian restaurant you’ve pulled up a seat in before, lit with anglepoise lamps and decorated with bold abstract artworks. The menu is made up of just a well-chosen handful of bold, confident dishes from throughout Italy; Venetian fish, Sicilian prawns, heartier offerings of red meats and tripe from Rome and the north. Desserts, equally typically Italian, are worth leaving a little room for, everything down to the handmade ice cream earning rave reviews from even the fussiest critics. Mele e Pere’s wine list includes around thirty bins at a range of prices. Offer applies to Set Menu. Another pre-theatre meal at Mele & Pere, this time before going to the Harold Pinter Theatre, a 5-10 minute walk away. Food and service were to their usual high standard, and the three course pre-theatre menu continues to be unbelievably good value. Highly recommended. We had 2 course lunch menu: beet salad was quite good although too salty. Both mains were bland and tasteless. 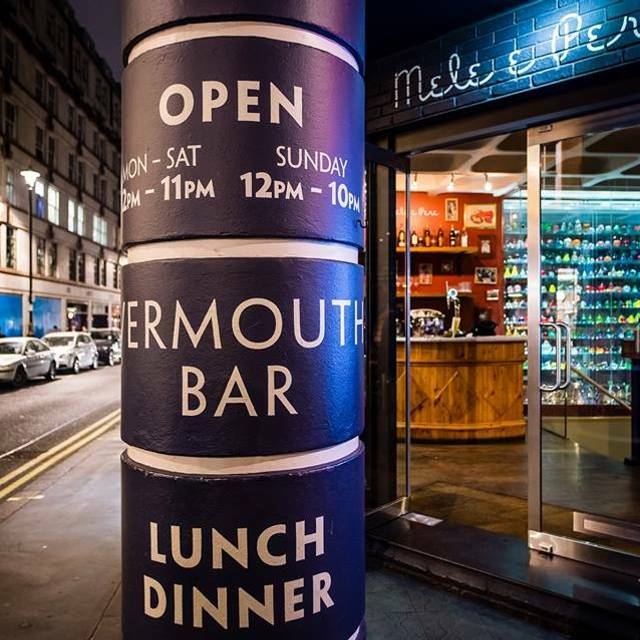 It might not look much from the street, but go downstairs to the restaurant and Mele E Pere has a really lovely atmosphere, not to mention a small but very well-executed menu. Loved the starters and sides - will be back again for the gelato! Special mention to the broccoli side dish, which was huge and absolutely delicious. Normally better food here. The truffle spaghetti was very poor. Pre-theatre dinner for two. Very fast friendly service, food was delicious, obviously freshly made. Nice ambience. Would recommend for a date night. We had the set menu for £19.50 including a glass of wine and 3 courses and it wasn't very good, particularly one of the starters were inedible. A friend ordered another starter, the Italian ham with toast and it looked lovely. As he was about to tuck in a waiter appeared and whipped it away explaining that there had been an error! Five minutes later they brought it back but 3/4 of it had been removed! The ragu was quite good as was the dessert but we couldn't help thinking that they should charge a little more and provide nicer food. Also was VERY noisy. They have acoustic panels on the ceiling but it is still noisy not helps by the loud music. Disappointing visit, service was chaotic as they had two new starters waiting on tables and they clearly didn’t have a clue - not their fault, but perhaps some shadowing would have made it smoother. Had to ask for our wine a few times. Went on Mother’s Day. Been twice before, but forgot how good the food was. Great menu choice for the offer (3 courses and bubbles for £20) and brilliant value too. Dishes were all freshly prepared and tasty whilst service was excellent. Would recommend for good Italian food. You feel cheated in this unusually busy restaurant...£24 for a very salty spaghetti like pasta with a few shavings of truffle, completely flat Prosecco which the management try and convince you is the way it should be, happy hour drinks which are limited in choice yet double the usual price to start with (and watered down)....etc, etc, etc. At least staff were pleasant and willing to listen to the poor feedback! Cannot ever recommend unfortunately! The food was fantastic! Excellent olives with nduja sausage! Lovely staff and venue. Had a wonderful evening! The kitchen was way too slow which forced the waiting staff and management to keep apologising for the delay. Business seem to be hopping but not if the kitchen can’t keep up. Good value 3 course plus buzz drink but nothing one could buy off the shelf from the supermarket. Ok for a quick Italian bite if you are in the area. Took some friends visiting from Japan here for dinner. We had the set menu. Lots of words in the menu I didn't understand so had to ask questions - it would help if the menu was easier to decode. Awful food on the set evening menu. Ragu dry as a bone. Great place for a big group. Patient waiters. Great location and value. Brilliant as always, this place never disappoints!! Great cost for money. Food wasn’t amazing, however, great value. The disappointment was the overall lack of service and quality/value for money of the main course. We both chose the Maltagliati with king prawns, mussels, chilli and garlic for £22.....that would be 2 king prawns, 5 tiny mussels (in fact 2 shells were empty) and a lukewarm, watery tomato based sauce with virtually no flavour or kick with bland pasta. We were also left in the corner of the restaurant with nobody taking a repeat drink order, and when my wife asked for a finger bowl (given we were peeling prawns) we were left with a dry bowl and a single napkin. We also had to appeal for 2 small plates from which to eat the cheese we ordered for afterwards. Overall, we got the impression that we were being rushed through our meal with very little attention given to whether we were content or not. The waiter did ask at the end if we enjoyed our meal and I pointed out the points above regarding the main course which were met with a hapless smile, so not sure whether anyone cared or not! A really lovely and lively place for a weekend evening meal. Fantastic service, particularly as we had a toddler and a baby with us and they made us feel really welcome and were very accommodating. The food was really delicious, far better than lots of the other Italians in this area. Just gorgeous. We had the pre theatre menu. Bargain!!! The food is authentic. Good quality ingredients. Tasty. Delicious. I was watching other people's food - am going again. We had the pre theatre menu. Great food, great location and great value. What a lovely pe-theatre lunch we had. It was pretty quiet when we were there, but there was a relaxed and comfortable atmosphere. The food was delicious and great value. We had the 3 course meal for £20. Thoroughly enjoyed our dinner here on a busy Saturday night.Rather large portions for our starters but with top quality ingredients. The Taglierini with butter, cheese and truffle was a stand-out dish. Yet another successful pre-theatre trip to Mele e Pere. The 3 courses + glass of prosecco menu is simply sensational value. This time I went for burrata, beef tagliatelli and fiordilatte affogato - all superb. Service as always was friendly and efficient. Not surprisingly, the restaurant was full by 6pm. So long as they maintain this standard and value, we will return time and time again. Food was ok, wouldn't go back in a rush. Service was good. Very loud, basic food, slow service. I do not recommend. Appalling service, felt like my server was ordering for me rather than listening to my order. The food was lovely, but I wouldn’t return due to the frustrating service provided. Nice waitress but lacked choice and atmosphere. Would not visit again. My third visit here for lunch, with three different friends. The food is very authentically Italian with some surprises for the 'uninitiated'. We have all enjoyed it immensely; the 2 course lunch with a glass of bubbly is excellent value. The worst food I have ever had! £18 for what looked like someones leftovers! It wasnt though as my companion had exactly the same. Only 2 prawns, 3 empty prawn shells and 3 clams, one of those empty in the pasta dish. No other seafood and only 2 small 2 inch squares of pasta. I complained and they replaced it with beef ragu which was very smelly and very strong flavoured. It was a stronger flavour than venison. Awful. One of our favourite places for a few years now. Consistently good food, well served, in a pleasant atmosphere, and completed by an interesting wine list. What's not to like? I have been to Mele e Pere several times and love it! 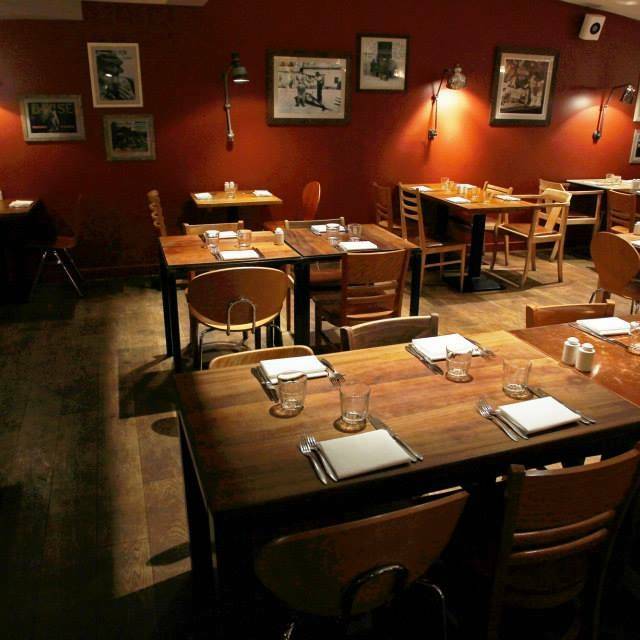 It's a great atmosphere, with delicious food and excellent service. Brilliant for catching up with friends or for a quick bite before the theatre.